How Do I Build WoodBlocX? This entry was posted on 22nd November 2017 by WoodBlocX. It was a great pleasure for us at WoodBlocX to recently work with the wonderfully talented Jekka McVicar on another garden project. This time the focus was on Health and Wellbeing, and the design incorporated a number of curved sections as well as a central seating area. 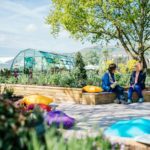 The garden forms the focus point of the new Live Well Zone at the RHS Malvern Show. The garden is inspired by the increasing need for reflection and escape from the stresses of modern life, and seeks to preserve and share the vital knowledge of how horticulture and its associated therapies can help soothe the mind, body and soul. The garden brings to life a living, working space for the mind, body and senses, and demonstrates the role gardens continue to play in our health and sense of wellbeing. The WoodBlocX team were on site for only four days to install the garden infrastructure before Jekka and her planting team were able to come in and really bring the space to life. The Health & Wellbeing Garden is in support of Pathways, a work-focused day service for adults with learning disabilities and difficulties. Pathways use gardening and the environment as an educational tool to introduce young adults to the working world. Clients of Pathways benefit from gaining vital skills for entering the working world including trust, communication, interaction with peers, taking direction and responsibility for themselves and others. Leaving a legacy, Jekka’s garden will provide Pathways with a nurturing space to continue their works in encouraging clients to grow, and WoodBlocX are proud to be associated. Throughout the show times, Pathways will sell plants and refreshments from the garden and funds raised will go towards covering the costs of the residential trip taken twice each year for clients of Pathways; a vital retreat for clients that contributes to their sense of wellbeing. Outside of show days, Pathways and local schools will host sessions in the garden, a garden which aims to inspire visitors of all ages and abilities with engaging elements tailored for all.